Heading north: Bishop-elect Tim Harris inside Sacred Heart Church at Clear Island Waters. Photo: Emilie Ng. 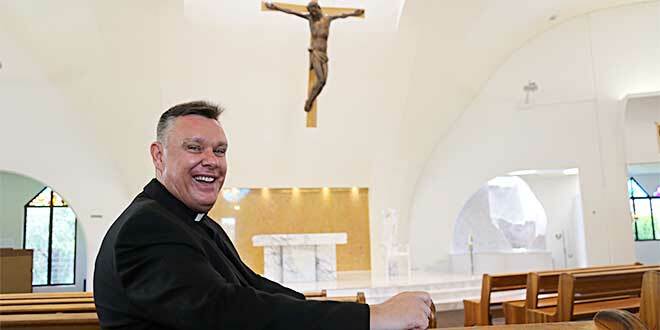 “LIFE can change in an instant,” Bishop-elect Tim Harris said at his final Mass in Surfers Paradise parish on February 26. He will be ordained the sixth Bishop of Townsville on May 3. “I’ve been living and reflecting (on) this very thing the last few weeks, following the nuncio’s phone call (announcing the appointment to Townsville),” Bishop-elect Harris said to about 1000 worshippers. Bishop-elect Harris made special mention of the support of his parents Jim and Shirley Harris who were represented by other family members. 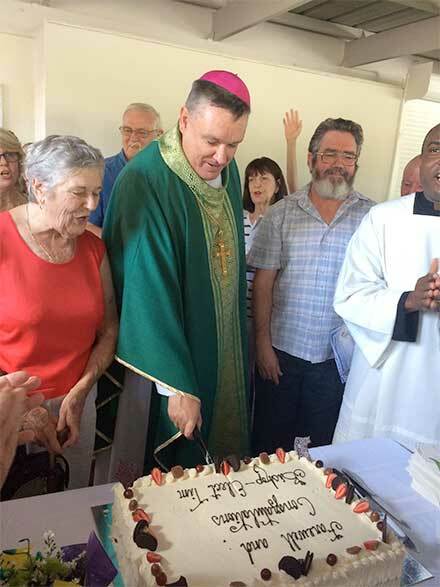 Farewell cut: Bishop-elect Tim Harris cuts his farewell cake at Surfers Paradise parish. The Mass included an operatic version of the Ave Maria by tenor Rocco Speranza. A well-attended brunch followed and Bishop-elect Harris made time for all those who were present to pass on their congratulations and farewell wishes. Associate pastor of Surfers Paradise parish Fr Nicholas Okafor spoke publicly of his gratitude for Bishop-elect Harris’ leadership. “(He) has given me responsibilities that have helped me to learn and grow as a priest,” Fr Okafor said. “He believes that an associate pastor learns by doing. Mistakes, for him, are part of the learning. “In the times when I was over-zealous as a young pastor, he applied the virtues of understanding, patience and tolerance. Fr Okafor said Bishop-elect Harris pastored with “ingenuity and sensitivity”. “He has been a parish priest with a listening ear; he never claimed to be an encyclopaedia of knowledge but always listened to the people and allowed them to speak their opinions; he is able to discern their gifts and encourage them to make use of them; he is not afraid to delegate responsibilities to the people that work with him; he is an effective and good team player,” he said. “The ingenuity and sensitivity with which Bishop-elect Tim pastored a large and diverse parish like Surfers Paradise on the Gold Coast is one of his gifts that will live with me forever. “I am going to greatly miss Fr Tim. “I have no doubt that his pastoral insights will help him in his new role. 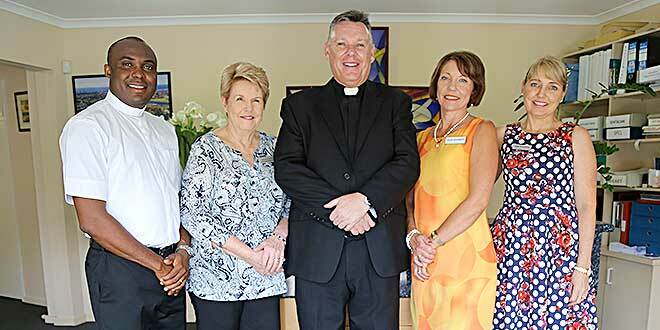 Working together: Surfers Paradise associate pastor Fr Nicholas Okafor, parish secretary Marylou Ayres, Bishop-elect Tim Harris, Pastoral Ministry Co-ordinator Helen Goldsmith and Parish Manager Sonya Slater.